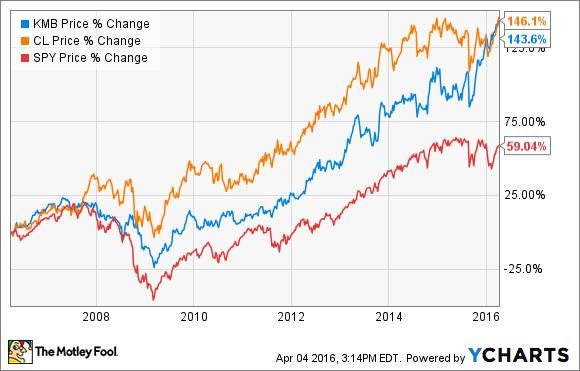 Colgate-Palmolive Company or Kimberly-Clark Corp.: Better Dividend Investment? Paper products outpace toothpaste (slightly) in this dividend titan showdown. If you use tissues, toilet paper, toothpaste, dish soap, or detergent, there's a good chance you've been helping to line the pockets of Kimberly-Clark (NYSE:KMB) and Colgate-Palmolive (NYSE:CL) shareholders. Brands such as Kleenex, Colgate, and Irish Spring make these companies two of the most solid dividend payers around, but one is a (slightly) better place for an investment today. THE ROAD TO RICHES IS PAVED WITH ... DIAPERS? IMAGE SOURCE: HUGGIES. Kimberly-Clark and Colgate-Palmolive are roughly similar in size -- with market caps of $50 billion and $63 billion, respectively -- and they sport similar dividend yields -- 2.7% and 2.2%, respectively. The similarities arise from their respective stables of powerful brands. When a father goes to the store to buy diapers, grabbing Huggies is a safe choice, even though it costs more than the generic brands. The same can be said when a mother goes to buy toothpaste for her children. She knows that Colgate will get the job done. In a world full of choices, brands make our lives easier. I don't need to stand in the aisle reading the ingredients on boxes of generic soaps to figure out what I might like. Irish Spring always smells the same and works just fine. We buy toothpaste, toilet paper, and soap in good times and bad, and for Kimberly-Clark and Colgate-Palmolive products, we end up paying a bit more. That's why these two companies, founded in 1872 and 1806, respectively, continue to be as relevant to daily lives today as they were a hundred years ago. Having been an investor in either of these companies over any long period of time would have led to riches. The past 10 years illustrates the incredible power that dividend payers like these can have in shaping a portfolio and providing income. In 2006, Colgate-Palmolive paid a quarterly dividend of $0.16, while Kimberly-Clark paid $0.49. Now, those quarterly payouts are $0.39 and $0.92, respectively. A thousand shares of Colgate-Palmolive purchased in 2006 would generate $160 per quarter, before taxes, that you could use for a steak dinner, gas for your car, or anything else that you pleased. Today you'd be receiving $390 each quarter, assuming you didn't reinvest dividends. Ten years from now, this payout is almost certain to be higher still. This is the magic of powerful brands and growing dividends. The result is similar with Kimberly-Clark. With both companies, you'd have handily outperformed the S&P 500. Both companies have strong international presences. Kimberly-Clark operates in 175 countries and holds No. 1 or No. 2 share positions in 80 of them. Colgate generates about 56% of oral, personal, and healthcare revenue from outside North America and Latin America. Forty-seven percent of total sales are from its oral-care division, but oral care makes up 86% of net sales in Asia. This situation could be viewed as a foothold from which Colgate-Palmolive could increases sales of its other products, but there's no natural marketing link between Colgate toothpaste and Speed Stick deodorant or Palmolive hand soap. Colgate-Palmolive doesn't have the product diversity in Asia that I would like to see, and it falls a bit short of Kimberly-Clark here. ORAL CARE IS THE NAME OF THE GAME FOR COLGATE-PALMOLIVE. IMAGE SOUCE: COLGATE-PALMOLIVE. Colgate-Palmolive's lack of product diversity in Asia, coupled with a slightly lower starting yield, and a slightly higher forward P/E ratio (23 vs. 21), causes it to lose by a nose to Kimberly-Clark if I were looking to buy one today. However, diversification is a wonderful thing, and buying both of these best-of-breed companies might be the soundest move of all. I'm currently in the process of looking to add more stodgy dividend payers to my portfolio, and these two are at the top of my list.